Running through to February 2019, the Arkhip Kuindzhi exhibition at the Engineering Wing of the Tretyakov Gallery pays tribute, on the occasion of the 175th anniversary of his birth, to one of the greatest Russian landscape painters of the second half of the 19th century. A contemporary of Vasily Polenov, Ivan Shishkin and Mikhail Klodt, Kuindzhi (1842-1910) could “singularly examine” nature to find a mysterious, captivating beauty in it, an ability that would contribute considerably to the rise of the genre of the symbolist landscape. The artist was especially attracted to scenes with arresting natural lighting effects - moonlit nights that beckoned in mystery, fiery sunsets, or the heat of the noonday sun. He set his sights on the earth and sea, mountains and sky, but most of all on space, which he regarded as the fulcrum of the Universe. 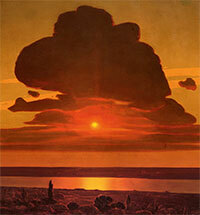 Full of musical and poetic allusions, Kuindzhi’s works draw viewers in, taking them towards philosophy. One of the Metropolitan Museum’s important acquisitions in European painting is a large landscape by the Russian, or, strictly speaking, Ukrainian, painter, Arkhip Ivanovich Kuindzhi (1842-1910): “Red Sunset on the Dnieper”. Despite its late date, 1905-08, the work is representative both of Kuindzhi’s own artistic career and of what might be called a Russian Luminist school. To those unfamiliar with the history of modern Russian art, this painting, reminiscent in its expressivity of the work of Western Luminists such as Albert Bierstadt, might seem to be a curious anomaly. But in the context of 19 th and 20th century Russian painting, “Red Sunset on the Dnieper” is a remarkable and important work. 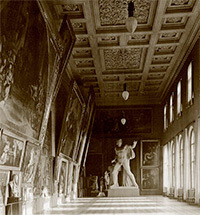 Its presence in the Museum helps focus attention on a field of aesthetic study still neglected and misinterpreted. 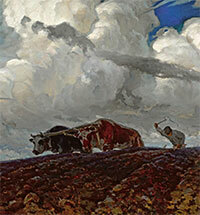 During the preparation of the new Kuindzhi exhibition at the Tretyakov Gallery research clarified certain circumstances and details relating to the painter and his art, including various episodes from the life both of Kuindzhi and those who were close to him, his artistic and public engagements, and the histories of some of his compositions. 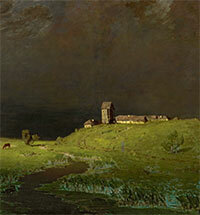 Although Kuindzhi was one of the most famous and sought-after painters of his day, many gaps in his biography remain. The paucity of archival material and scarcity of surviving letters make it almost impossible to determine what the artist himself thought about the role of painting, or to clarify the characteristic features of his artistic practice. Evidently Kuindzhi, “lazy” at writing letters, preferred personal contact to such correspondence, and discussion, of the sort described in the memoirs of those who witnessed such moments, to philosophizing on the page. All this gives special value to these new pieces of information about Kuindzhi’s life and work that have been found. The character of the Russian landscape painter Arkhip Ivanovich Kuindzhi has been shrouded in legend for more than a century. The artist rose from poverty to become, in the second half of his life, a millionaire owner of apartment buildings in St. Petersburg, but was not accustomed to talking about himself, or his childhood or family. He left no diaries or notes after his death, and the artist’s private correspondence focused mainly on business matters and reveals little about him. Kuindzhi’s first biographers, gathering material for their 1913 monograph about the artist, were challenged by such a lack of basic information. A new investigation reveals fascinating details about the time Kuindzhi’s students spent in Crimea at their teacher’s generous invitation. “Beauty begets a painter like the earth begets grass" these words from the “Essays about Crimea" by the renowned expert on regional history and culture Yevgeny Markov fully apply to Arkhip Kuindzhi. 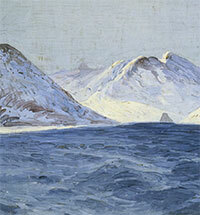 The artist’s entire life was intimately associated with the peninsula: he was born into a family of Greek migrants from Crimea; in his youth he visited Aivazovsky’s studio in Feodosia; his landscape A Tatar Saklia [Hut] in Crimea” earned him the rank of artist; and he attempted to found a colony of artists there... 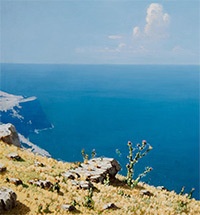 The desire to share its beauty also inspired Kuindzhi to organize and finance a summer arts study trip for his students in Crimea. A student of Arkhip Kuindzhi, Ferdynand Ruszczyc (1870-1936) became a renowned landscape and graphic artist, stage designer and educator, professor and public figure. Along with such prominent realist painters as the brothers Apollinary and Ipalit Goravsky, Stanislav Zhukovsky and Vitold Byalynitsky-Birulya, he laid the foundation for the Belarus school of landscape painting. 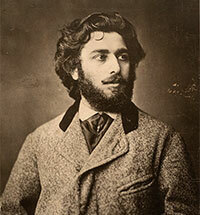 Through his significant contributions to the evolution of his country’s visual arts and overall spiritual renewal in the 20th century, Ruszczyc earned personal fame as an artist, as well as recognition for his ancient family, which was descended from the Belarus landed gentry’s Clan Lis. One of Kuindzhi’s students at his landscape workshop at the post-reform Imperial Academy of Fine Arts in St. Petersburg, in 1894-1897, was a taciturn, hard-working native of the Baltic governorates, Vilhelms Purvītis (1872-1945). 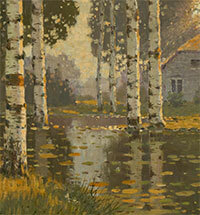 He later became a central figure in Latvian art of the first half of the 20th century. 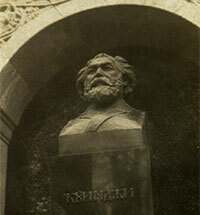 Commissioned by the “Kuindzhi Society of Artists”, Alexei Shchusev worked on the monument to his mentor over the course of two years, modifying his vision together with his collaborators, notably the artist Nicholas Roerich. Such a process, involving a synthesis of the arts, would prove significant in Shchusev’s later work, including the Lenin Mausoleum.